Saturday we went to Racine Zoo. This is a small zoo but anything with animals works for Lauren....well and me really. It is right on the shore of Lake Michigan. It is hard to believe that this is a lake. Looking at the beach and the waves, your senses are sometimes fooled and I am sure I can smell the sea. I remember learning about the Great Lakes at school but I never thought it could be as beautiful as this. After the zoo we went to Apple Holler. We pass this place on our way to Chicago/ airport etc but had never been in. It started as a fruit farm but now boasts a "country restaurant" with "old fashioned country food" too. The food was way overpriced. They got my order wrong and then when they put it right it wasn't very nice anyway. So, I had an ice cream. They also have a children's play area, corn maze (I got lost in that pretty quick), petting zoo (buy food to feed our goats for us), hay rides, pony rides ...blah blah blah. 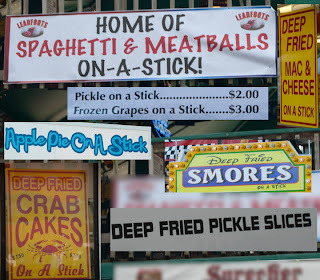 What they don't tell you in all their advertising, is that you have to pay extra for each of these things and it soon mounts up. The best part was the goat bridge which joined two goat enclosures. Atop this bridge was a billy goat who got very excited if he saw people down below. We soon worked out why. There was a pulley contraption with cups on it. You put some of your goat food in a cup and then turned the handle which, very slowly, took the cup up to the bridge and emptied it out for the billy goat to eat. Oh wow, did he get in a state waiting for the cup to get up to him. It must have been 'his' bridge because we noticed he didn't allow any of the others up there. Sunday it was off to the airport. All went well there. We had both had a bit of a 'blub' Saturday night so I think we got it out of our systems. She went off with the air steward, all smiles. My stomach was in a tight knot all day. This morning I spoke with Donna and she has arrived safely. She said the flight was boring. I told her that is what you always want....... a boring flight, perfect. I should be going over there in 3 weeks, so it won't be long before I see her and the rest of the family. We took a couple of the kids from up the road out for a McDonald's tonight. It was a sort of penance.....no I don't mean it. Lauren has spent a lot of time with them and it was just a little 'thank you' treat. This is a special McDonald's. It is called Solid Gold and is filled with pop & rock memorabilia. If you haven't got 3 kids to keep control over then you could spend a long time looking and reading about all the exhibits. We didn't quite manage that. The motorbike seats proved popular. I put Philip in charge of Austin. I think it was a sort of "Baptism of Fire". This kid is hilarious though.........if he isn't yours and you can give him back.........bless. "Oh our car has one of those!!" "What?" we seemed to reply in unison. I giggled at him most of the way. Coming home he suddenly announced that he was "gassy". Then he said, "Yes, I am gassy..........and now I am farting." I think he reminds me of Glenn. Monday we had a lazy ish day. Well Lauren did. I had lots of washing and ironing to catch up on. It was the last River Rhythms of the summer last night. It is so hard to believe that it is over for this year. They did end on a high note though. The band was 5 Card Studs. We saw them a couple of years ago and they are a really fun band. As well as being very good musicians they make fun of being a "lounge band". "And this one is for the ladies". It is all done in such fun that the women love him and the blokes all like him too. That is quite hard to achieve. Even Philip likes this band and didn't even take his book...........that is even harder to achieve. There was an extra "Stud" this time. A dear little one. He only looked about 5 but stood up there the whole time strumming his guitar. They said they were training him for their retirement. He has already got all the "old madam". That little boy "played" the whole evening. He won't take a lot of training. and the little one Chevvy Tahoe. Philip even bought a Christmas CD from them. Caesar did warn him it is a bit risque. Woo hoo....that should liven Christmas up a bit. As you can see in the photo, Father Christmas was at River Rhythms. He must spend his holiday in Milwaukee. His disguise was pretty good but his red bag gave him away. I was a little sad coming home. River Rhythms is over and then Lauren will be going back Sunday. Next week will seem rather quiet I think. This was a novel contraption. We saw it as we returned from Irish Fest on Saturday. All those people are pedalling. They are also sitting at a bar drinking beer. There is a guy at the front, who one presumes is sober, doing the actual steering. I reckon I could get away with the same thing I did whenever I got talked into going on one of those 2, 3 or 4 seater bikes that you always see on holiday. I always faked the pedalling and just sat there. Sitting there with a glass of wine or three whilst pretending to pedal would be even better. Plus, they were going around taking in the sites of Milwaukee. River Rhythms was fun on Wednesday. Everything in Milwaukee has been very Irish and very green this week. The band was Irish/Cajun and very lively. Lauren liked them a lot. A couple of sausages from Milwaukee Brewers baseball team showed up. They were a lot of fun and even tried a bit of an Irish jig along with the band. It must have been awfully hot in there though. Saturday we went to Irish Fest on the Lakefront. This is one of the bigger festivals. I heard one man in the queue say that he and his wife came every year from Florida, just for Irish Fest. Lots & lots of dancing, fiddling, tug o war, boozing etc. I am wearing a dress in this pic. YES ...me ...in a.....DRESS. See, I do have legs. It was very hot again so after a few hours we had had enough and came home. Lauren went out with her mates and we relaxed a bit. Sunday was a bimbling day. We went out for brekkie and then bimbled around the shops for bits and pieces. I will try not to be too sad because I shall be heading for England just 3 weeks after she has gone back. After getting his @#$% whooped at pucker golf, Philip had a chance of revenge at mini golf. I didn't play as although I enjoy it, I find it plays my back up something shocking since I hurt it recently. I did get to wear the lucky hat though. It was neck & neck. Both got a hole in one, at different holes. Both scored over 6 on a couple of occasions. In the end when I added it up......it was a draw. So a rematch would seem to be the order of the day. Last night we were invited down to Mary & Marty's for s'mores. I don't know if they do this in England but it is very big over here, particularly with campers. I know a couple of campers so they might want to write this recipe down and arm themselves with the ingredients (all 3 of them) before their next trip. You need the big, fat marshmallows. Put one on a stick and toast it over the fire. Be warned if you toast it too close or too long it will quickly turn black. Some people like them like that but a golden brown is what you should aim for. You also need graham crackers - these are like thin digestives. Any thin, sweet biscuit would do I am sure. You also need bars of chocolate. When you have your marshmallow hot & golden you place it and a couple of squares of chocolate between two biscuits. You then squish them together. The heat from the marshmallow melts the chocolate a little. They got the name s'more because you always want s'more. I think this would be a fun thing to do whilst camping. All those who have imbibed a bevvy or three should be aware that an over toasted marshmallow will either drop off the stick or slide down it very quickly if you hold it up. When it lands in your lap you will find you sober up rather swiftly. When we walked back to our house the fire flies were out. I love them. They look like little fairies to me. Wednesday I took Lauren to work with me. We didn't do River Rhythms in the evening as the band looked a bit pants, the weather was so hot and she was still covered in itchy lumps from the last time. Next week the band looks more promising and the weather a little cooler. She has been swimming every afternoon with the kids down the road. Thursday we bimbled about a bit. We went to the mall where she managed to spend more money. Friday we went swimming with my mate June. She still lives in the apartments where we used to live. They have an indoor and outdoor pool there so we spent the morning in the outdoor one. Usually June and I just use the indoor but it is more fun in the outdoor one with Lauren. For some reason it makes you feel as if you are holiday. When we got back we were just going to have some lunch when the kids from down the road appeared and wanted Lauren. So, she ate her grub, put her other cozzie on and went off to swim again. By the time I got her back she looked like a prune. Saturday we did more bimbling. This time with Philip in tow. Sunday was off to the zoo to see the dinosaurs. It was a lot of fun but so very tiring. The weather today was hot but not so humid. Amazing how much difference the humidity makes. SpongeBob put in an appearance again and drew comments from several excited children. I think we saw almost all of Milwaukee Zoo and then spent time in TWO gift shops. They had an extra one by the dinosaur exhibit. I had a sad last night. Lauren was in bed and I was saying night night. She asked for a head tickle (our family are anybody's for a head tickle). I was tickling her head and her eyes were closed, when her hand crept out of the sheets and started to tickle my head too. I will admit the tears flowed. I didn't let her know but it was such a touching moment. We get on so well and I so love her company. It will be very tough when she goes home. Poor Philip ( he will have a humpty me to put up with for a bit). But, 3 weeks after she goes back then I will be going over there. I will be there for a month and then both Donna and Lauren will be coming here for Christmas and New Year. So, really as they were here in February this year also, I have been rather spoiled. Next year will be tough as I will probably only see her in the summer. Sometimes I question my decision to make a life here but I then weigh things up. If I wasn't here then Donna, Glenn & Lauren would not have been able to visit the US as much, or probably at all. I know Lauren is very proud of being able to pop across for a holiday. Also, Donna's husband Andy (Lauren's dad) ....sigh. He would never have had the 3 holidays they had here. They were with us for the Christmas of 2002. He told me that it was the best Christmas he had ever had. We took them to The Nutcracker, Christmas Carol, ice hockey, friend's parties......it was a fabulous 2 weeks. No one knew it would be his last and he would be dead within a few months. This one thing pulls me up if ever I question being here. He deserved that Christmas. It was only a couple of weeks later that he was taken ill. I still miss him and still can't understand why he has gone. Oops.....I nearly got another sad and Andy, who was always making people laugh as well as making fun of me, would give me a hard time if he knew. I suppose it is just that when I see Lauren growing up so quickly it seems such a shame he isn't around to see it. Monday Philip took Lauren to play golf. I have given her my clubs as I haven't played for over a year now. I found it really hurt my wrist and arm so it put me off. She was more chuffed over having a trolley to pull around than anything. Nope....not true.........she was mostly chuffed over whooping Philip's a@$%& than anything else. He mumbled something about the scoring being a bit off but at the end of the day she won. She has had a few lessons and apparently it shows. Now if only the mosquitoes hadn't been biting her. Tuesday we were off to Old World Wisconsin. Really interesting place.......like travelling back in time ( 1800's) to Little House on the Prairie. All the houses, farms, church, town hall, school house etc were all original buildings that had been brought together to show how tough things were back then. In each house/farm etc there were people in period costume who told and showed us how things were done. Butter churning, soap making etc. It was really a hard life. I had no idea. They also had toys and games of the times too. Funny how the kids loved these old wooden toys. We did too actually. We all played with them. One really cool toy was called Hoops & Graces. (Picture at the top). You have a couple of sticks each and a hoop. You put the hoop on your set of crossed sticks and then just pull them apart. The hoop, in theory, flies to the other person who catches it on his sticks and does the same thing back to you. I was pants at it. My hoop just flew off sideways. Philip and Lauren, after a bit of practice were brill. They finished up doing it with 2 hoops at the same time. The ladies asked if they wouldn't mind staying there and demonstrating while they all went off for some tea with me. The stilts were popular too. A kind lady spent a couple of minutes showing Lauren what to do and after a wobbly start she was off. Lauren talked about those wooden toys all the way home. When I told her that was all the kids back then would have to play with she said "Cool". I am sure she would soon miss this though. Back home with just enough energy for a touch of Rock Band. The bloody mosquitoes are a nightmare this year. It said on the news that this is the worst year ever for mozzies or skeeters (as they are known here). We sprayed ourselves all over with repellent but they still bit Lauren again at Old Wisconsin. It is very hot here at the moment so what with that and skeeters, I think we only saw about half of the village before exhaustion set in. They do have little trams that run constantly around the place. The cost is included in your ticket and you can get on and off as many times as you like. I think it would be wonderful in the Autumn when the weather is cooler and the leaves are changing. Of course there was a gift shop. They sold sets of Hoops & Graces and I would have bought one for Lauren but they were $27. I have since found them on the interwebs for around $19. I bet they would be a lot of fun for those people who like to go camping. Wow what a week that was. Then the weekend went .........whoosh. We parked at the mall and then took the special fair bus directly to the festivities. Having met Gary in there we took in all the usual fun. 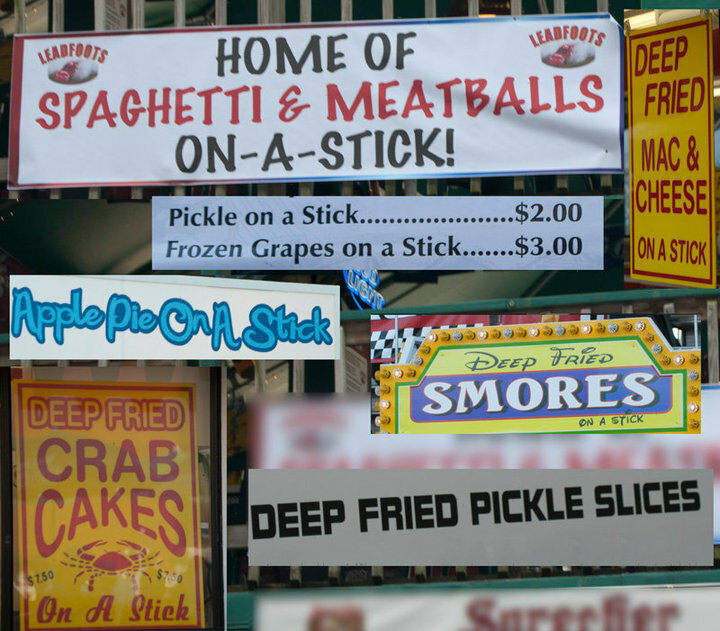 It seems they come up with more and more food that is "on a stick" every year. This comprised a doughnut (instead of a bun) filled with a cheeseburger. For an extra dollar you could have chocolate covered bacon in there too. Believe it or not there was a queue of people waiting to buy these. Philip wore the SpongeBob t. shirt that we bought him for his birthday. It was the most popular he has ever been. Every few yards a child would yell......."There's SpongeBob". The funniest incident was on the bus coming home. I was sitting next to Lauren and Philip had an empty seat next to him. An elderly couple got on and were looking for seats. The lady found one and then loudly ordered her husband to "go up the back and sit next to SpongeBob". Lauren and I had a fit of the giggles. The fair was brill. Lots of animals, lots of food, lots of rides, lots of music, lots of beer and lots of toot to spend money on. We only saw about a quarter of it before we were exhausted. They did have a dinosaur exhibit too which was very well done. Sunday it was Discovery World. We had never been there before. It is a huge new building, right on the lake front. You could look out over the lake and it was beautiful. One side of Discovery World is dedicated to all things aquatic. This had aquariums with a tunnel you could walk through and some of the floors were glass so that the fish swam under you too. It was quite unnerving to walk over them at first. Then there was the touch pool. This had rays & horseshoe crabs one side and sturgeon the other side. The sturgeon were big and acted just like puppies, rolling over for a belly rub. We couldn't get Lauren away from those. The other side is all about the sciences. Lots of hands on stuff. We had a blast in there but then had to go back to the fish so she could play with the sturgeon again. Lastly it was the gift shop. As is usual the stuff in there was way overpriced and I managed to convince Lauren to buy just one thing instead of wasting more money on "old toot". By the time we got home the weekend had gone and we were all worn out. Today we haven't been anywhere but Lauren is going to play golf with Philip when he comes home from work. There is a small par 3 course near here that she should enjoy. She is more chuffed that my clubs have a little trolley that she can pull. I bet she will like dragging that around more than playing golf. 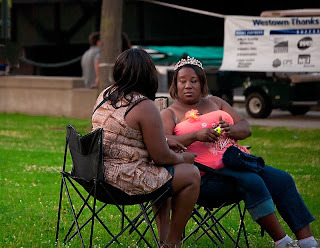 The River Rhythms Queen seemed to be in attendance last night. Very regal she looked too until she bent over for something. I thought Gary's eyes would pop out as well as two other large things. We have had a brill week so far. We've been out and about every day. Tomorrow evening they are showing The Wizard of Oz at River Flicks in the park. They show it on a huge screen. Saturday we are off to State Fair and then Sunday it is Discovery World. My goodness she put some food away last night. She has met up with some of her mates here and has been out most of the afternoon. It is a lot of fun having a child around. I hope the time doesn't fly past too quickly. But, 3 weeks after she goes back then I go over there. When I come back it will be almost Halloween. The next you know it will be Christmas and Donna and Lauren are both spending Christmas and New Year with us this year. So I can't complain. I get to see quite a lot of her really. After a restless night and a nervous day we set off for the airport to pick up our precious cargo. It took 45 minutes for her to get through immigration and come through the gate. We had a pink & white bunny waiting for her this year. It has become something of a tradition to have a cuddly toy with us. She said the flight was boring and we told her, a boring flight is exactly what you want. No one wants an exciting flight. She was up before the lark had even blinked. The time difference can take some adjusting to. I am taking some adjusting to it too. In the morning we drew dinosaurs, made an anniversary card and then went swimming with June. Swimming was a lot of fun. She still has Disney flippers that I bought her in 2003.......I think they must be growing with her. We went in the outdoor pool as it feels more like being on holiday. Well I think so. The weather is warm too. In the afternoon she started on the cardboard boxes. Many stables were made and then onto cardboard cat boxes. Lollipop supervised, of course. Lauren might do it all wrong otherwise. She then wrapped Philip's birthday prezzies up and right now she is writing his cards. We are doing his birthday when he comes home. I think we are going out for dinner too.......that will be nice. In a little while we shall be off to The Mall.......and to Lauren's favourite shop. Her mum has told me she isn't allowed to bring any more "old toot" home. So whatever she buys will have to stay in her bedroom here. I will still let her buy stuff. She likes her "old toot". She does seem to be growing up fast now and I can't help looking back to the first time she came over at just 5 months old. She is now 11. How can that be?